Knowing I'd have the opportunity to order fabric online and ship to a friend's house in Seattle, I went a tad bit crazy stocking up my stash. Here are some future garment projects - enough for three shirts and 2 dresses. I also thought of myself as being quite "responsible" by purchasing costly yardage for planned quilt backs and saving on shipping (I'm sure you're nodding in agreement). And now because you're probably scratching your head wondering where I plan to store all these goodies, let me introduce my craft storage closet. My current projects are taped up on the wall with washi tape. It helps keep me focused on the tasks (and due dates at hand). 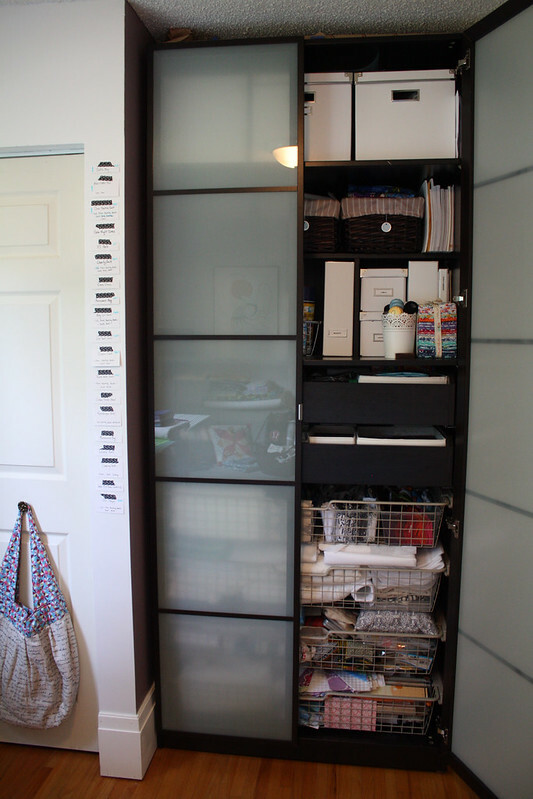 I bought this closet on Kijiji for less than half of what they charge at Ikea and while my husband thought it was still a bit costly, we both value how useful it has been at keeping my crafts reigned in. The white boxes on the very top shelf hold our tax papers, my little yarn stash and knitting needles, and a box of sock monkey materials. The next shelf holds three baskets (that are supposed to hold the three WiPs I'm currently working on, but honestly they are full of baby flannel and wax print fabric right now). Next to those baskets is my modest selection of quilt books. The third shelf stores some of my yardage, aerosols (starch, 505 etc), patterns and little boxes of labels and fasteners (zippers, velcro, snaps, ribbon etc). This shelf also holds an affordable Ikea planter that my Perle cottons sit in. 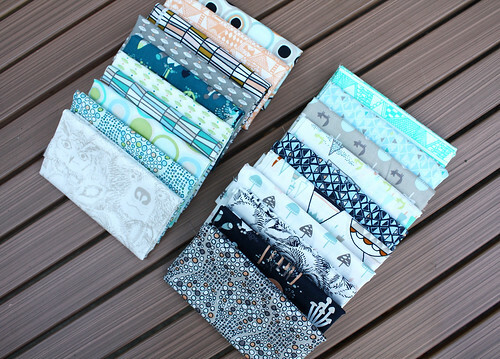 You might notice a sweet little FQ bundle of Kate Spain's Cuzco line that I recently won in a super generous giveaway by Shayla and Kristy over at Sassafras Lane! Gosh do I ever feel like a lucky lady! I can't wait to cut into this bundle really soon. 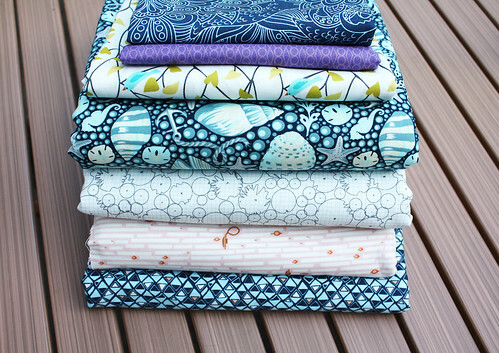 In the second drawer, I have an assortment of garment and quilt back yardage, as well as a few fabric collections (Indian Summer and 1001 Peeps), a quilt that I haven't shown on the blog yet. This drawer also holds a whole lot of stash blenders. I tend to collect 'tone on tone' prints (without very much white) for the most part as I find they fit easily into projects. Many of these were from this past years' Stash Stack Club. The next drawer holds a bit more fabric yardage, as well as my scraps. It looks pretty disorganized but if you look closely I have 4 clear plastic bins. The 1st holds red, orange, yellow and pink scraps. The 2nd holds green, blue and purple scraps. The 3rd holds black, grey and white scraps, and the 4th bin holds solids. I'm looking to start a Canadian Scrappy Bee soon for anyone else you might be interested in sewing up some of their scraps and shipping them cross country. Fellow Canucks, let me know if you'd be interested. Cross stitch, embroidery and other hand projects, as well as my glue gun and small scrap booking items. Miscellaneous drawer. Mostly holds UFOs and WiPs (of various craft types). I hope you have enjoyed a sneak peak at how I store my stash (sorry it was a bit long winded). I'm linking up to 'Sunday Stash' over at Finding Fifth and 'You Show me Yours, I'll Show you Mine' over at Sarah Quilts. 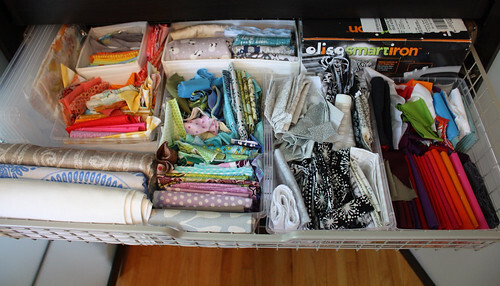 I have had such a blast checking out how everyone organizes their stash on Sarah's blog and I was thrilled to hear she extended her linky party. Come check out all of the fun! Nice stash! 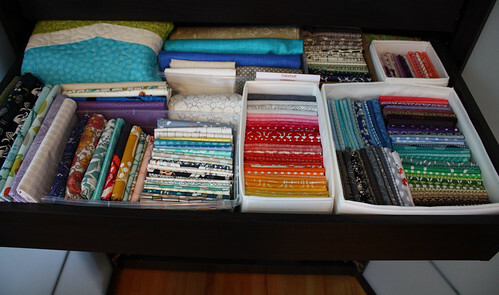 It's really interesting to see how everyone organises their stash - your system looks pretty similar to mine, except I keep my fabric in drawers rather than a cupboard. I would totally be responsible like you and save on shipping if I was visiting the US! 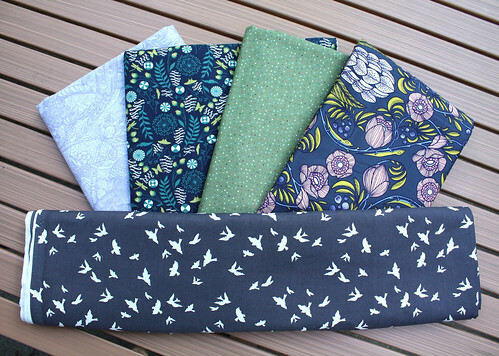 I am drooling over that bird fabric in your first photo and your Indian Summer FQs. Definitely a little jealous :) Loved seeing your stash, you are so organized! Thanks for sharing!! Thanks so much for linking up! Your stash is really great and really organized! How will you ever cut into that Kate Spain when it looks so good on your shelf? You definitely made the responsible choice by purchasing before leaving the states! We can always come up with excuses for more fabric, can't we? I need to sort my scraps like that. Good idea. I love organization! But you didn't tell us where you bought your new fabric additions from? 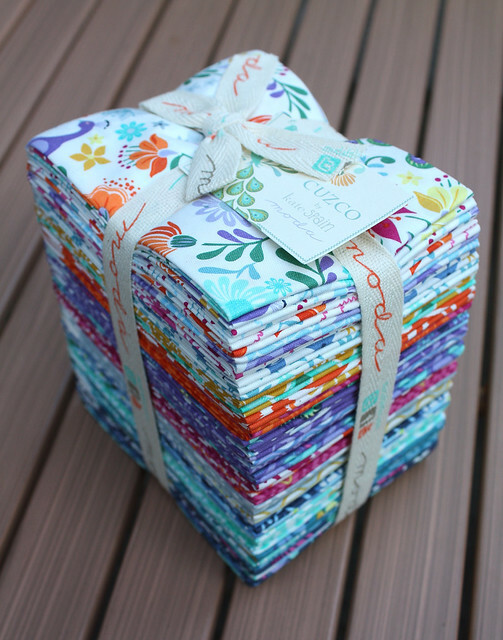 Cuzco is beautiful - I had a charm pack that I used for a baby quilt and I loved using it. Very responsible indeed, delicious bunch of goodies! Love the Indian Summer, not that you didn't already know that, can't wait to see what it becomes! Count me in for the Scraptastic Canada Bee!! OK, so it IS responsible to order yardage all at once. If you're going to pay the shipping, you stuff as much into that shipment as you can. LOVE your garment fabrics choices! I'm eager to see what they become. 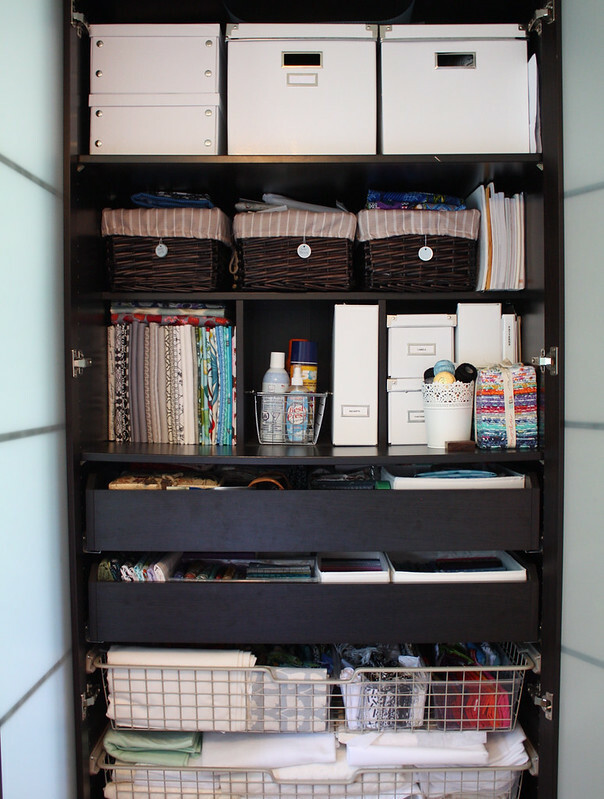 Your craft closet is so enviable. It's a thing of beauty in itself. Love the frosted glass cabinet doors.